Please make sure that you can provide a valid provisional driving licence and that you can read a car number plate from a distance of 67 feet. Whether you’re a beginner or partly trained we can assess how many hours you will need on your course and if you’re available we’ll arrange up to 4 hours of one-to-one tuition per day. This will help you reach the DSA test standard faster and if you need help with your theory test we can do this during your course. FREE theory C.D.’s are available when you pay for a block-booking of 10 hours or more. 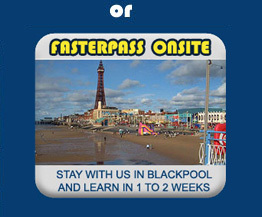 FASTERPASS will arrange for the earliest DSA driving test in your area! If you haven’t driven before here are some of the subjects covered on your course. Taking prompt and appropriate action on all road markings, traffic signs etc. Showing awareness and anticipation of the actions of pedestrians, cyclists and other drivers.